Happy Father’s Day to all you Dads out there!! First, I want to wish Kevin, my Step-Dad a wonderful Father’s Day. Sorry we are so far apart! I miss you!! I hope you have a great day, full of sunshine and fun!! If you were here, we would throw you a barbecue and play crockett! 🙂 That was fun when we did that!! 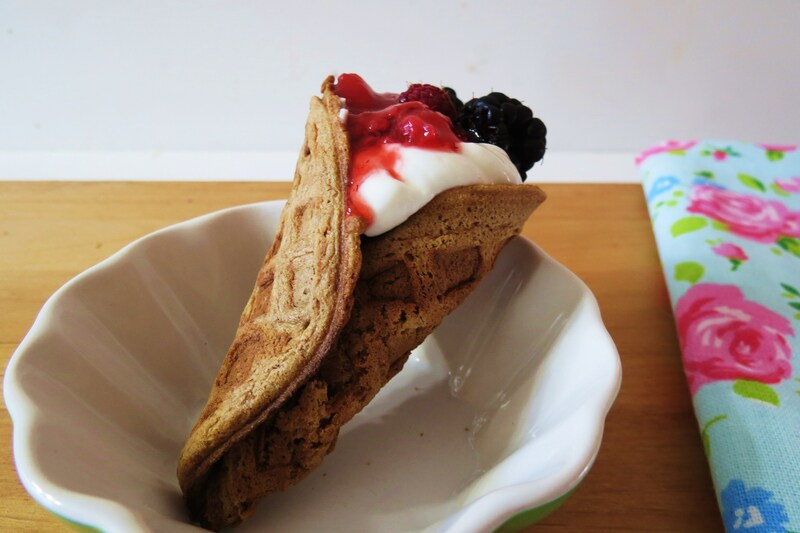 Today, I thought I would bring you a fun way to eat your yogurt and a great way to get your kids to eat healthy! Ever since I was a kid I have always loved sugar cones, but never cared for the cup cones, but I still ate them because they were filled with ice cream goodness. Now that I have gotten older and became obsessive with calories and sugar, I stopped eating them all together, until now!! This my Friends, I bring you the healthy waffle cone!!! This is such an easy recipe to make, that it may shock you or maybe you have done this before? All I did is take a frozen waffle, defrosted it by letting it sit on my counter and rolled it with a rolling-pin till it became flat. How simple is that? The calories on this, depends on what brand of frozen waffles you like. I chose Vans, but any waffle will do!! Than I stuck it with a toothpick to hold together. Than I stuck it the grate of a 350 degree oven for 5 minutes! Sorry for the not so pretty picture, but I wanted you to see how I put it in the oven. After 5 minutes of baking, pull the toothpick out and let it cool for just a couple of minutes. Than fill it with whatever you like. 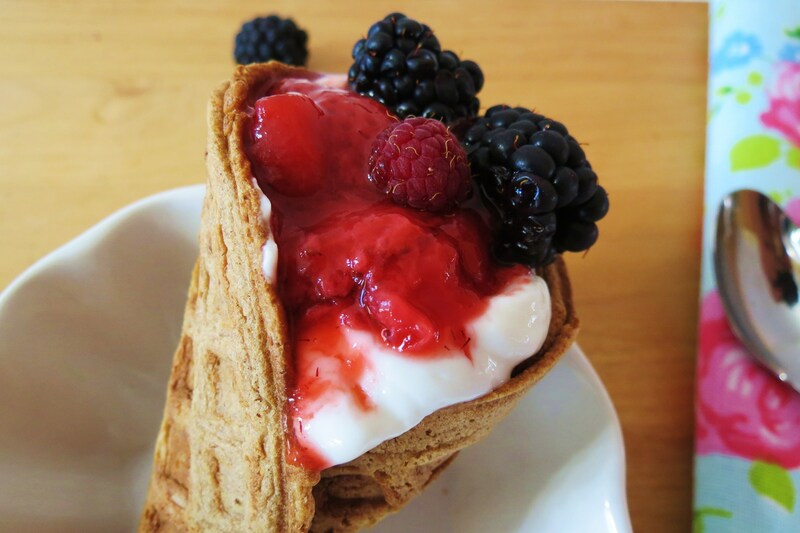 Now you know I LOVE my Chobani yogurt so I to put about 1/4 cup of greek yogurt in my cone and had this for breakfast. You could use ice cream or anything else you like. Kids will LOVE this!! The kid in me loves it too!! 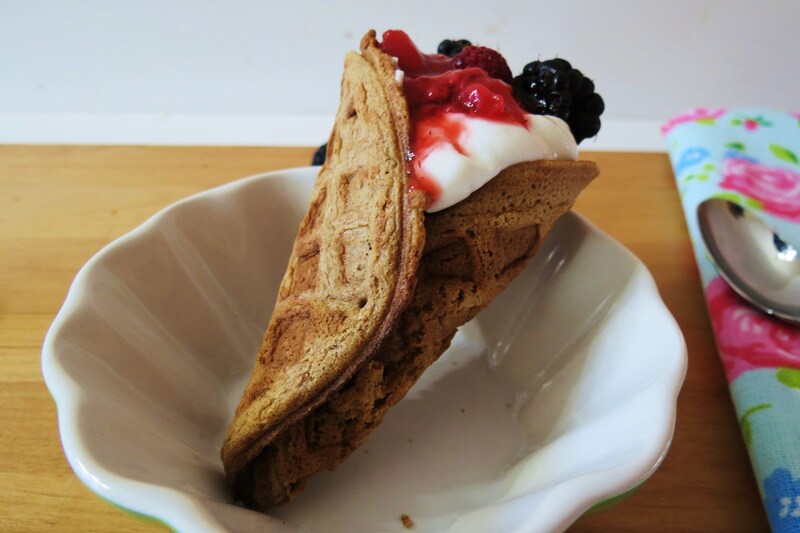 Expect stock of waffles to go up because I’m making these all of the time. This is such a healthy, fun, great breakfast and/or snack! My cone with yogurt and toppings came in at just about 100 calories! I was even surprised that the yogurt didn’t seep out of the bottom of the cone. One thing I almost forgot to mention is the cone is crispy! I was afraid it would be to soft, but nope, it even made a crunch sound when you bite into it! So 5 minutes is a perfect amount of time to bake and it took only about 2 minutes to prep it! I am thinking you could even make a batch of these and seal them up on the counter for a day or two, but I haven’t tried that so I’m not sure. 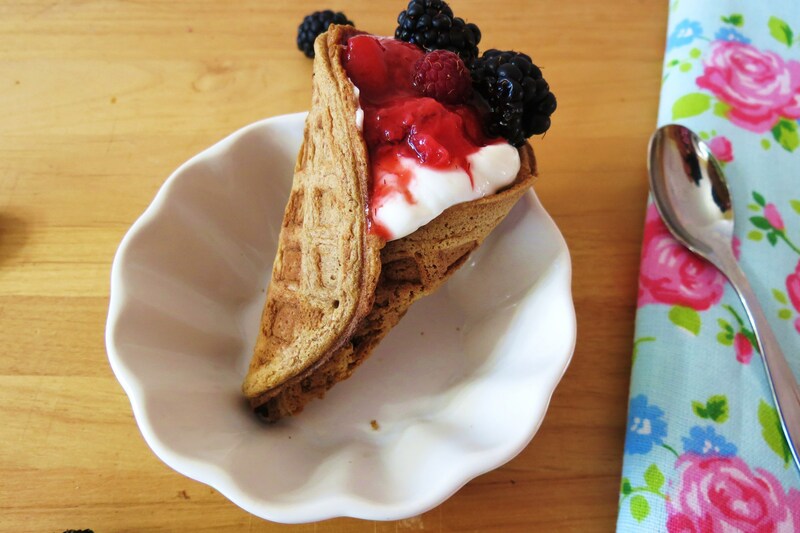 A healthy,quick, easy fun way to make waffle cones. 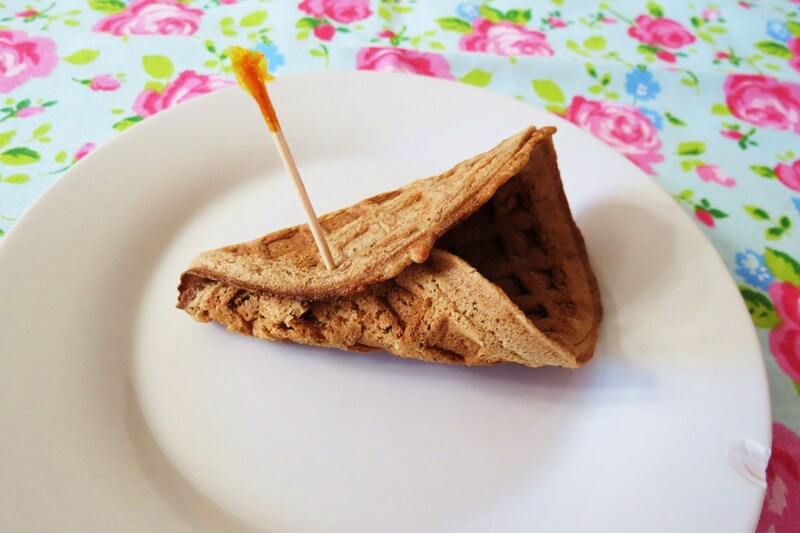 Take your defrosted waffle and with a rolling pin, roll out to as flat as you can get it. Fold up to shape as a cone and take your toothpick to hold together. You do not need to poke the toothpick all the way through. 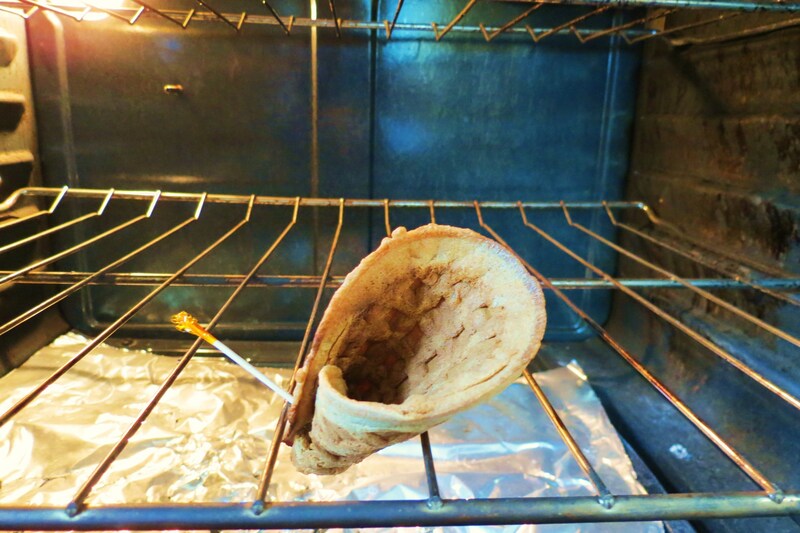 Place the waffle between the grates of the shelves in your oven and bake for 5 minutes. Take out of the oven and pull the toothpick out. Let it cool for a few minutes and fill with what ever you want. I didn't add calories, since it all depends on what waffles you use and what you fill it with. Simply enjoy!! As I am writing this, I am getting lots of ideas of fun things I can fill my cones with!! But now that we have the base down, we can create fun ideas with our cones, so stay tuned This isn’t the end of my new-found fun waffle cones! So tell me, what would you like to fill your cone with? he he I got a fun idea, I can’t wait to share with you!! Well, I am off to Trader Joe’s! My TJ’s is celebrating 5 years in its location, so there having a BBQ, a taste off, face painting and singing, so I must go!! This is BRILLIANT. Will be making ALL the time. Thank you!! 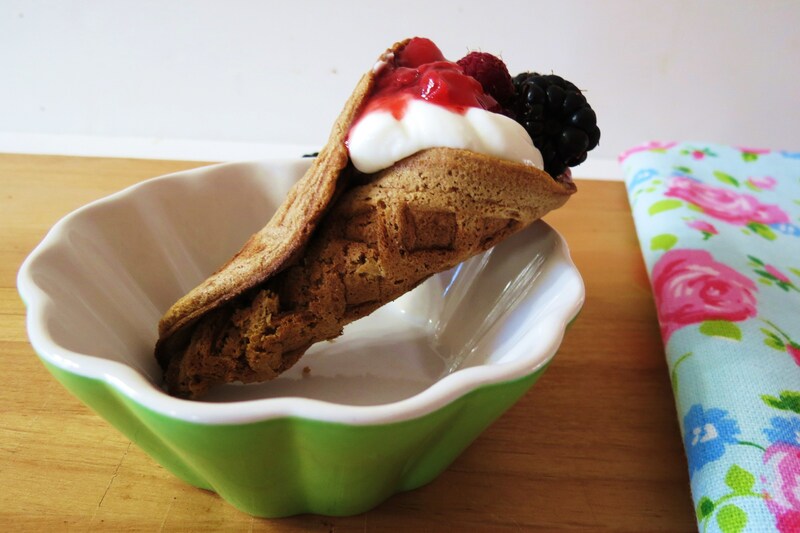 There fun to make and even better to eat! what a great idea! 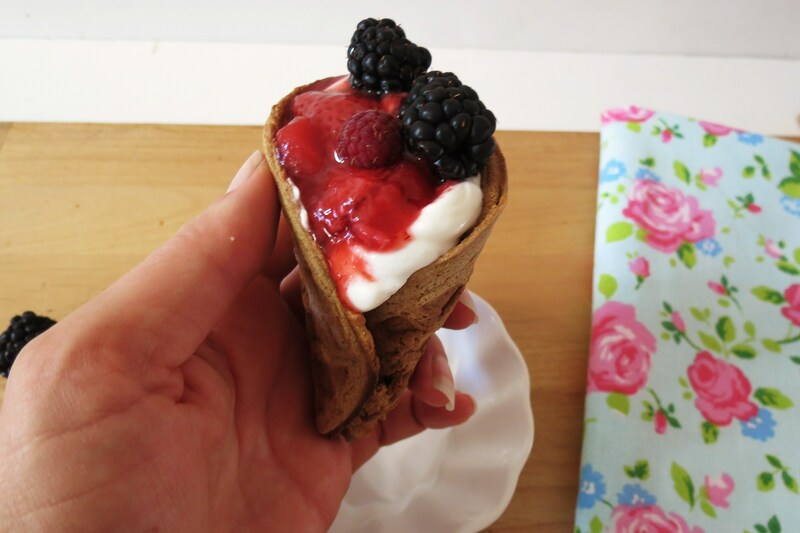 there is nothing better than an ice cream-soaked waffle cone and now a homemade one…perfect! Thank you! I like this idea and I like that you can fill it with ice cream, yogurt or berries with whip cream!! Ummmm YUM!! Such a cute idea! Thanks! My Husband thought it was pretty clever and wondered why I didn’t make one for him. lol, Next time!